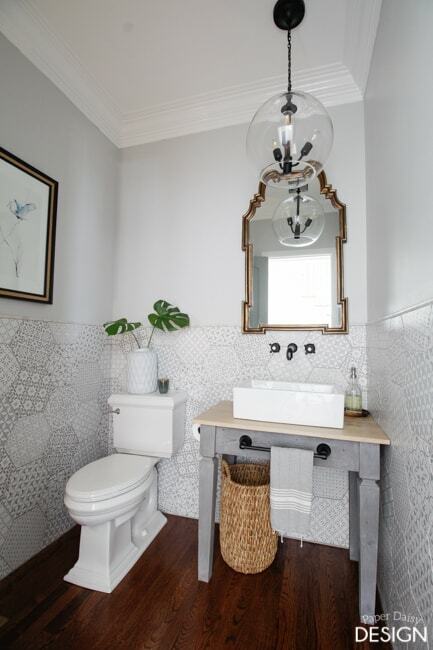 Of any room in #theTrailHouseReno, this one is definitely the smallest. 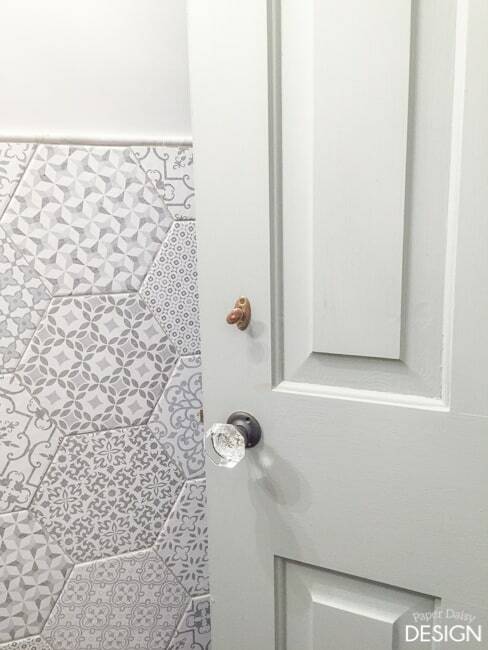 It’s just a powder room. 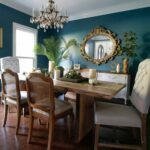 But this little room has received the biggest transformation of any space so far. 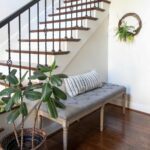 This renovation and blog post were, in part, made possible by a partnership with South Cypress. 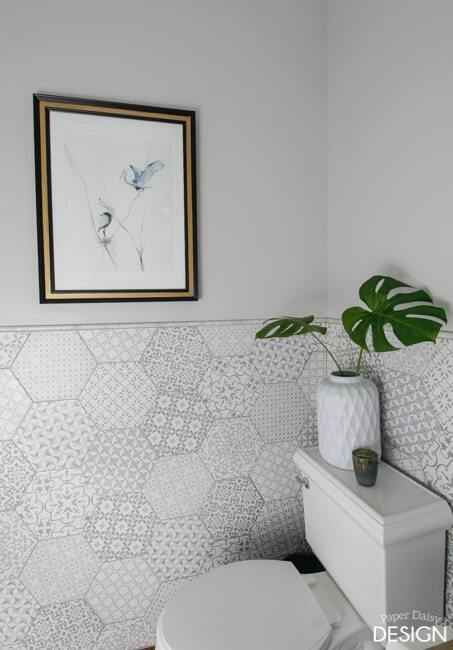 Obviously, the walls are adorned with stellar patterned, hexagon tiles. 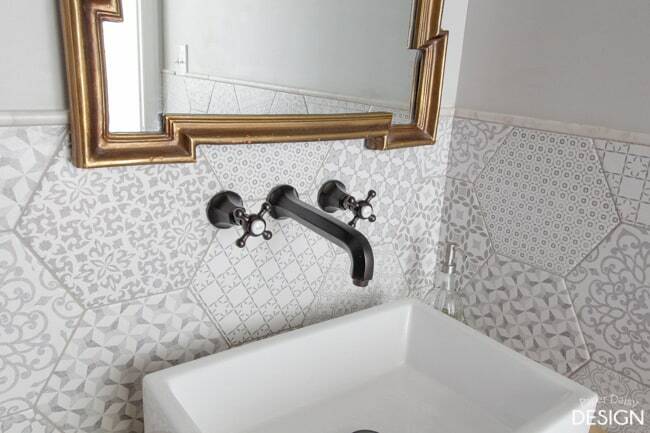 Adding a wall-mounted faucet was no small change either. But to truly appreciate how far the room has come, you have to see more than just one before photo. 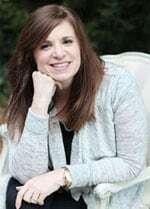 Because if you took just a quick glance at this photo you would miss the magnitude of the transformation. 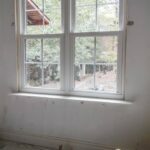 You have to see the other before photo too. 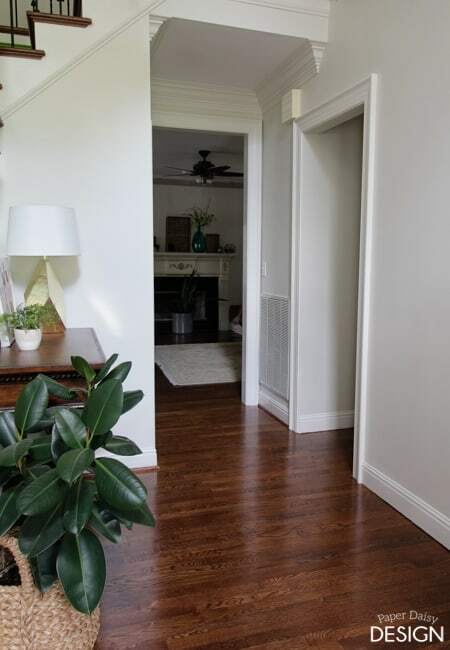 The original floorplan had the powder room directly across from the master bedroom, which was inconvenient to the rest of the house and awkward. I wanted to just simply flip the space. But, the biggest obstacle to this being a simple transition was the main air conditioning return vent located right next to the closet. Here is a transition photo to give you some visual reference. In the foreground of this photo is the old entry. 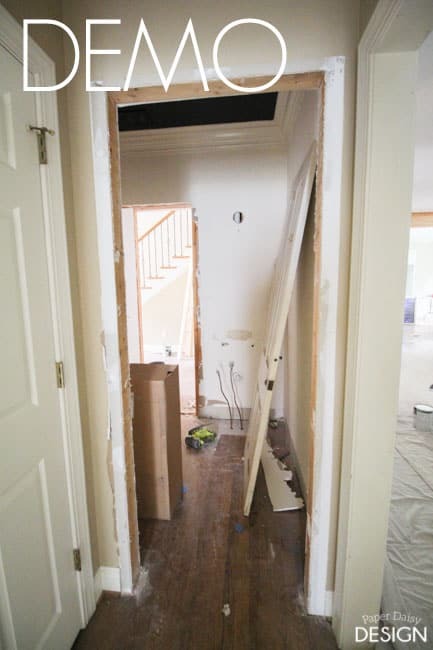 The opening in the back of the photo is the new entry door cut open and framed up. So instead of the expensive endeavor of moving the air return, we added a petite hallway, a vestibule. 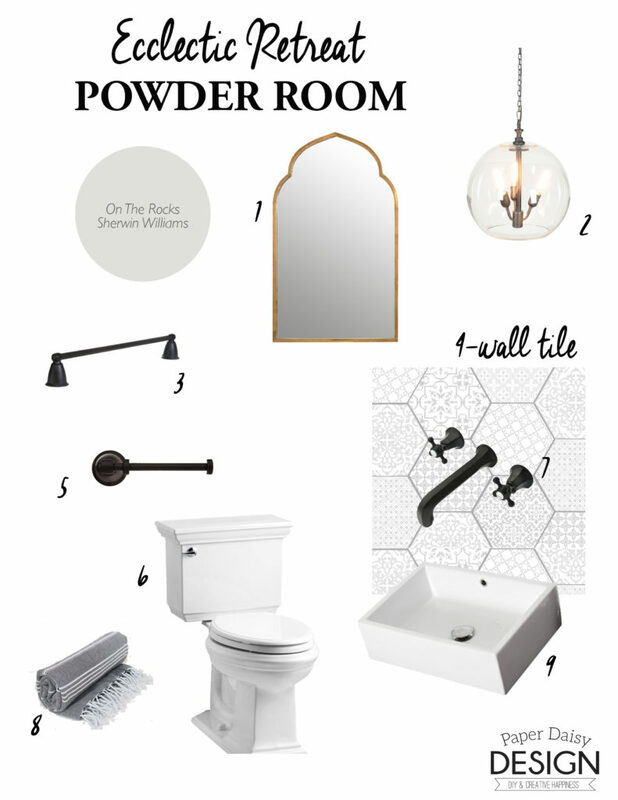 And now the powder room is in a logical position in the home with easy access from the center of the house. Logistically, all it required was to flip the plumbing to what was essentially the previous entrance wall. 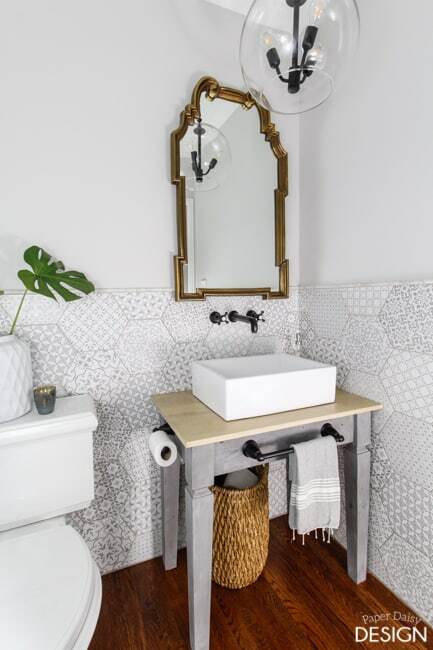 The toilet is sitting exactly where you would have walked into the room previously. 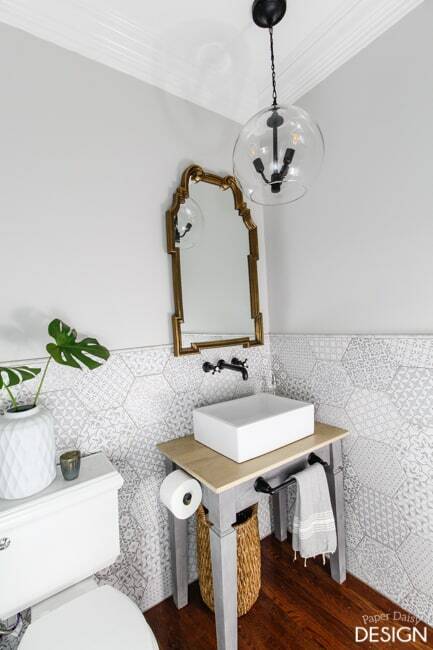 Now let’s talk about the design of the actual powder room. 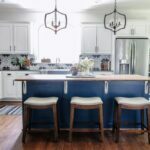 With one single light fixture in the space I wanted it to be stylish and functional. This oversized globe pendant fit the subtle bohemian vibe I was going for. The art is a favorite watercolor print of herons nesting from Minted. Growing up near the bayous of southern Louisiana, the simplicity of the birds are a beautiful reminder of my past. 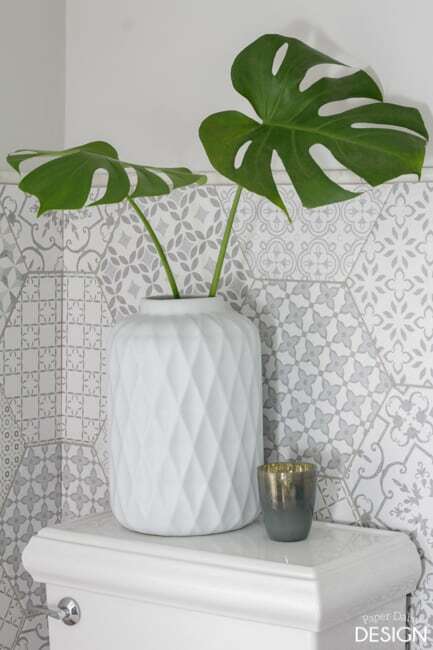 The tile from SouthCypress.com is one of my favorite features in the room. 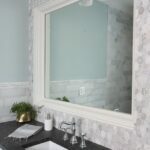 South Cypress is an online tile company I have partnered with for several rooms in the Trail House. 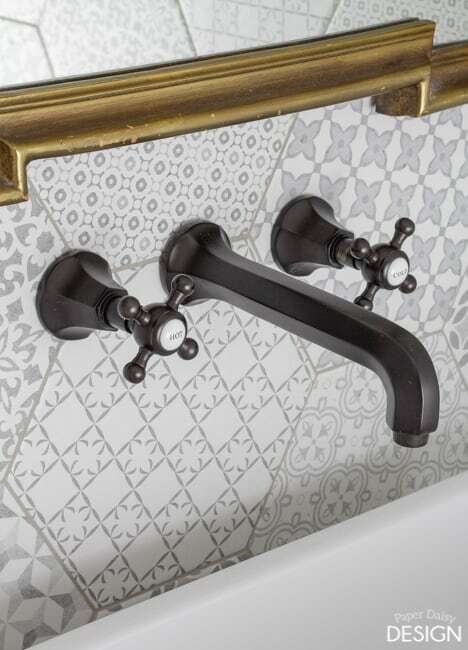 I had the luxury, living in Birmingham, to visit their headquarters and their new uber-stylish, clean-lined showroom. 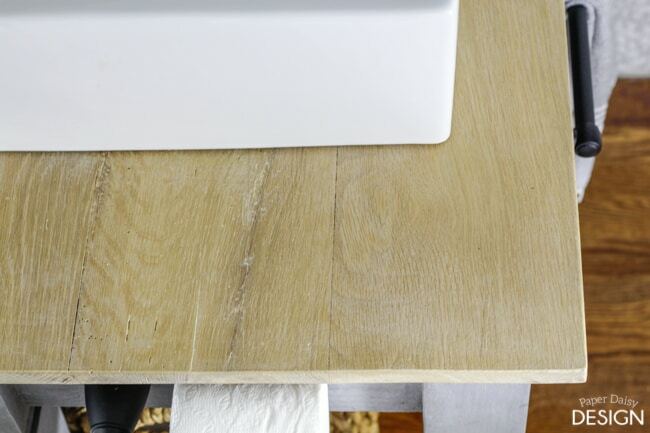 Not only are they amazing to work with, but I love that they are committed to offering the most fashion-forward flooring, often with exclusive product lines, at affordable price points. 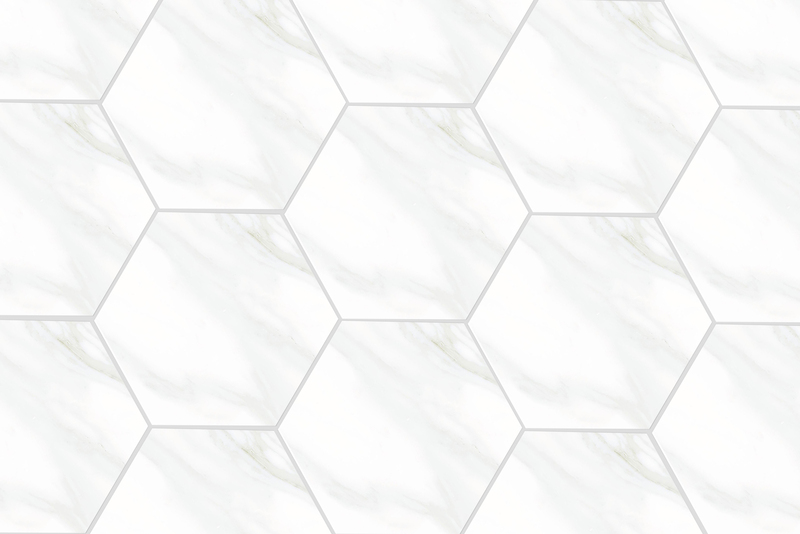 Originally, they marketed the tile as a mix of marble hexagon with a pattern tile added randomly. Equally beautiful no doubt. 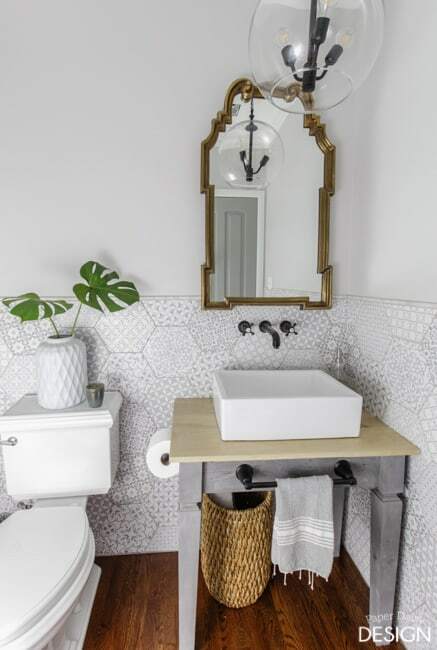 But being so inspired by the bold pattern mixes of Portuguese tile, I asked them if I could use only the patterned tiles. 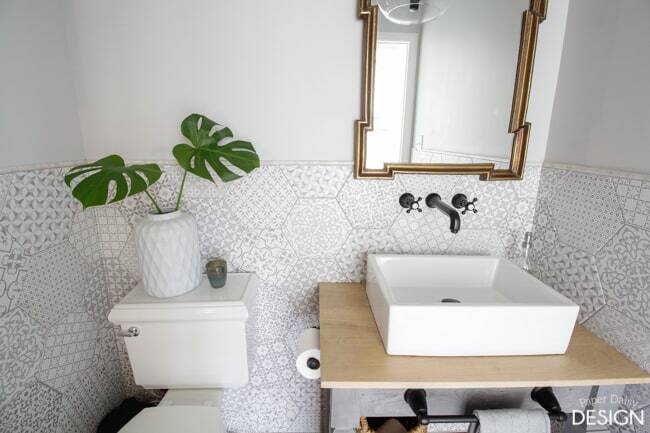 Obviously, they obliged by sending me all 10 variations of the tile patterns. 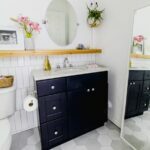 I custom designed and built the vanity to fit the space and the rectangular vessel sink. For the blog post about the building plans and the how-tos for the vanity and the finishes, click here. 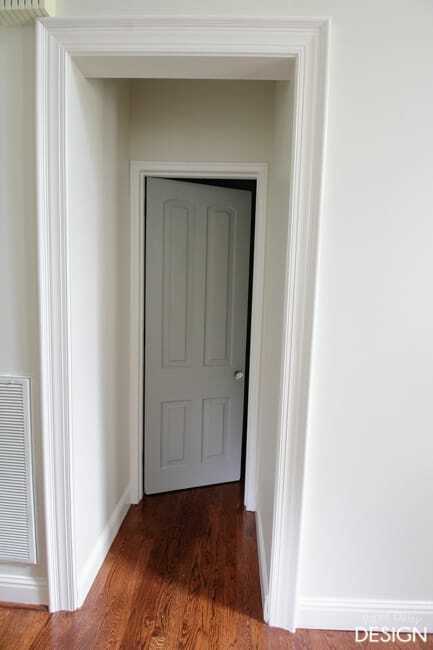 Of course, any room with its own vestibule needs to have a very special entry door. 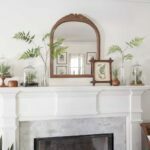 This antique door and glass hexagon knob from Southern Accents Architectural Antiques is the perfect compliment to this little jewel of a room. 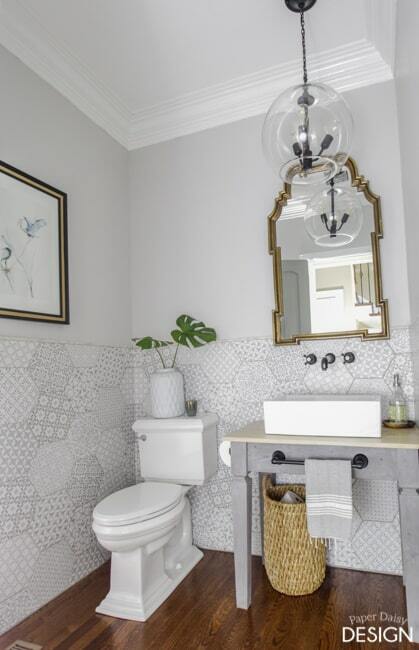 I love the way this ho-hum room was completely transformed in nearly every way to create a powder room with charm and style. 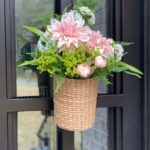 Hopefully, it is the perfect way to welcome guests. 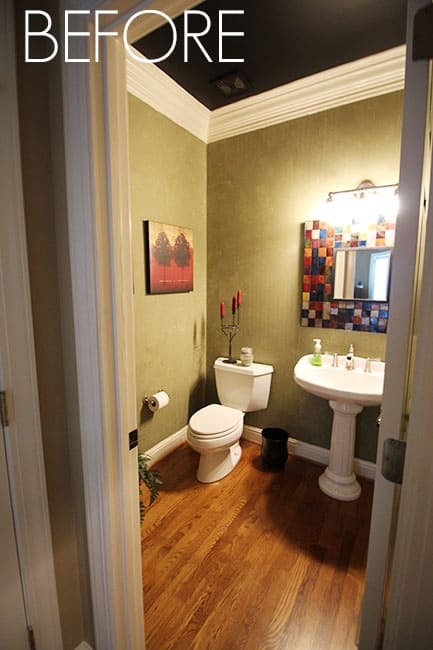 Except in our case, for now anyway, this is the only functioning bathroom on the main level. So you can imagine we are quite happy it is complete especially with the long-awaited door in place! 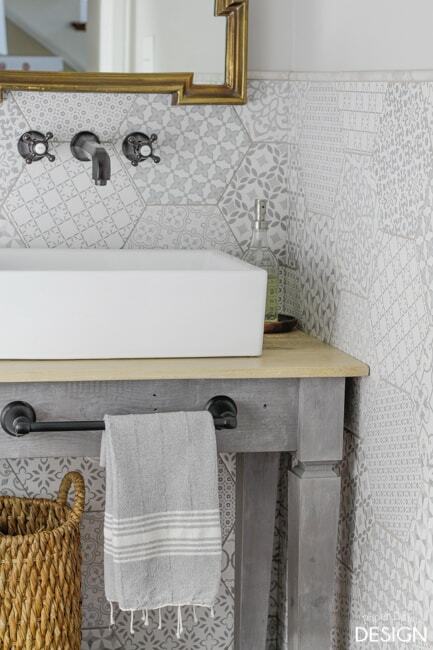 Get the look for your bathroom with the links provided below. I received tile for this renovation from South Cypress. All words and opinions are my own and, as always, I only partner with brands I would personally recommend to my friends and of course my readers. 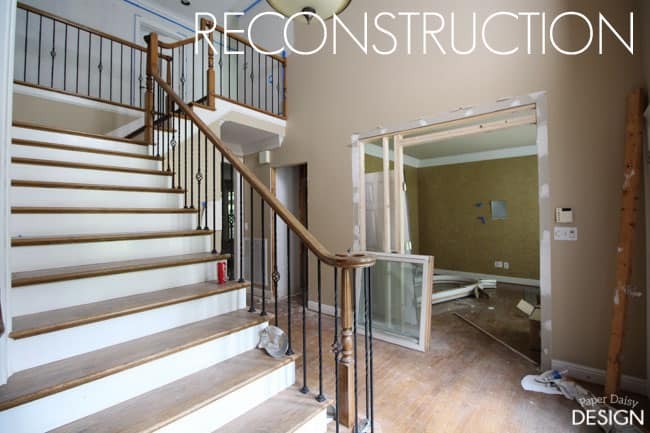 « #theTrailHouseReno: Where do we go from here? What a transformation! 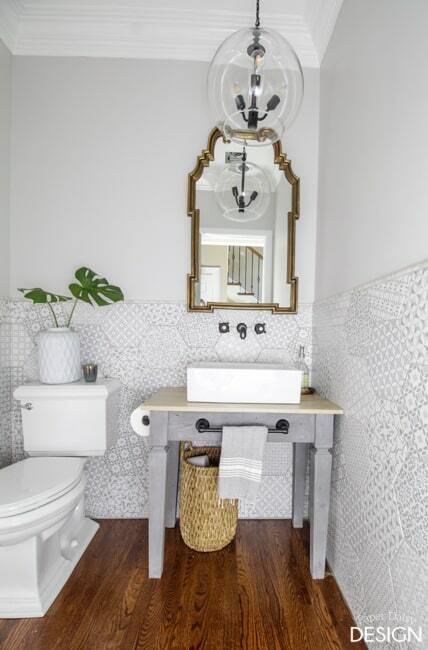 The lighting fixture, the vanity, that gorgeous tile… it’s all so beautiful! And not even mentioning the reconfiguration of the room. Wow, excellent job ! Thank you!! The change in the layout makes a huge difference to the way the house functions. You are so creative! Love, love what you have done. Nice to see it coming together little by little.